If Polka Dots were Marc Jacobs' print of 2012, then Stripes are this year's hot print. The Marc Jacobs Spring 2013 show was, in stark contrast to fall's over-the-top theatrics (fur pimp hats, Winter Wonderland stage, embellished everything), quite simple in its construction and presentation. While Fall was bold in its adventurism, Spring was bold in a clean-cut way. Stripes were the predominant motif of the night, usually in thick contrasting colors (usually black and white) on boxy, geometrically-shaped articles of clothing. 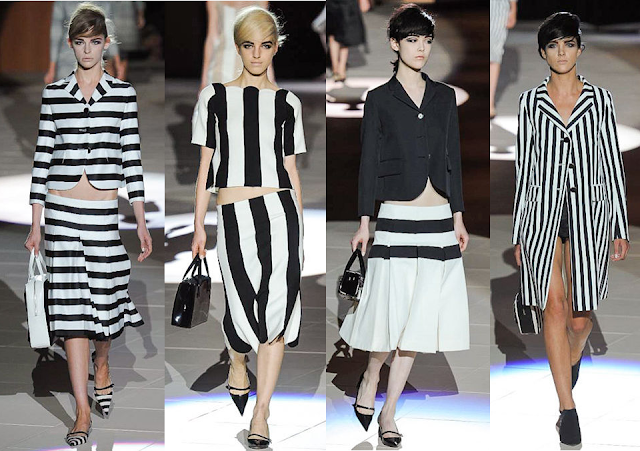 The eye-makeup, the thick black and white stripes- much of the first half of the show had me thinking of 1930s cartoons and a caricature of the thirties in general. If the stripes alone weren't reason enough for me to draw the connection, a sweater with a vintage black and white Mickey Mouse sure did convince me that Jacobs drew upon Popeye's Olive Oil as muse. Then there were obvious connections between Jacob's Big Top Circus of a Resort Collection and Spring. While muted in tone and theatricality, there were still plenty of clown references- more of a sad, depressed clown though, or even mimes. 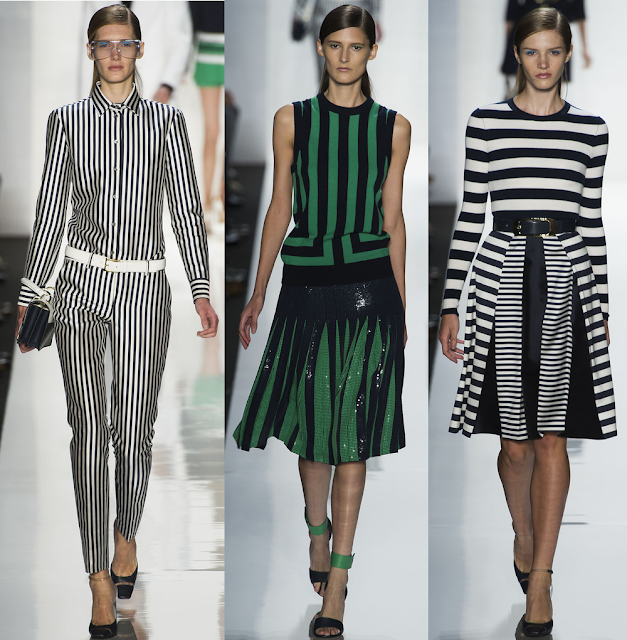 Elsewhere, Michael Kors featured all sorts of stripes in his collection. Kors opted for more colors and experimented with stripes of different widths and directions. 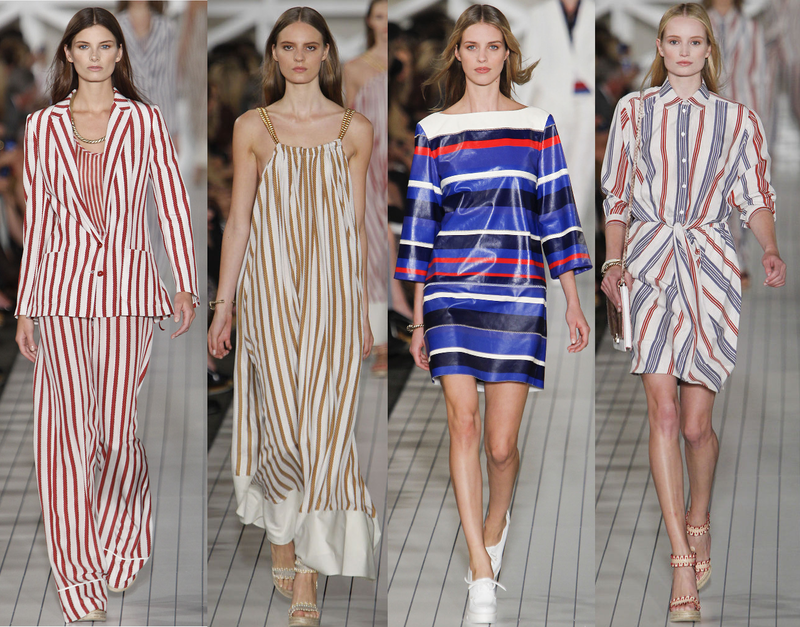 Tommy Hilfiger also utilized a plethora of stripes, including both delicate thin stripes in soft fabrics and thick, bold, primary-colored stripes that stand out. Are you a fan of the Linear movement? What stripey show was your favorite?